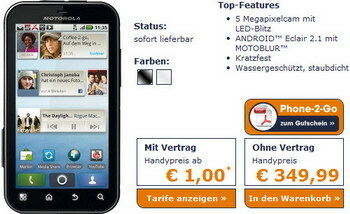 Motorola Defy is now available in black and "white on black" in Germany via The Phone House starting at 1 EUR on contract (depending on terms and operator) and for 350 EUR SIM-free. As reminder, the Motorola Defy is an IP67-certified phone that features Android 2.1 Eclair OS with MOTOBLUR UI, 5MP camera, a 3.7-inch WVGA capacitive touchscreen with Gorilla Glass, Swype keyboard app, HSPA, WiFi, DLNA support, GPS, 512MB RAM, 800MHz processor, 2GB onboard storage, and microSD cards. 0 comments on "IP67-certified Motorola Defy Android-powered rugged phone available in Germany"